Just can't wait until winter to go skiing or riding in North America? These seven ski resorts traditionally open early and offer the opportunity to hit the slopes in October and November. Why Go: With the most extensive snowmaking system in the East, including 300 new guns, Sunday River has opened on Halloween five out of the past six years, affording skiers and riders the chance to slide on snow surrounded by Maine’s beautiful autumnal foliage. The T2 trail is always the first to open, followed by Locke and Barker mountains. Don’t Miss: Check out the opening-day scene/costume party in the Barker Lodge parking lot, and look for the Tin Mountain Round Up when donations of tinned goods will score you a discounted lift ticket. Why Go: Though it doesn’t officially open this year until Nov. 16, Grand Targhee has been known to open early when conditions permit (with an annual average snowfall of 500+ inches, conditions permit about 25 to 30 percent of the time). 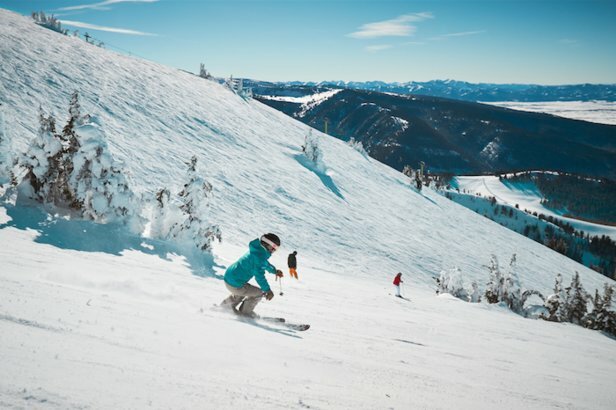 And unlike at many other resorts, early-season skiing at Targhee—starting on the Shoshone lift and spreading out from there—is almost exclusively on natural snow. Don’t Miss: Check out Targhee’s early-season Snowcat Adventure Packages, which start at just $413 per person. The offer includes three nights’ lodging, a one-day lift ticket, and a full day of Grand Targhee Snowcat Adventure skiing between opening day and Dec. 19. Why Go: The largest resort in the Canadian Rockies, Lake Louise is always one of Canada’s first resorts to open for skiing each winter. 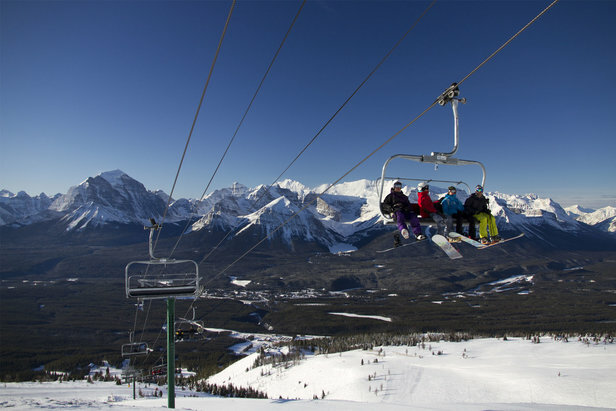 This year, opening day is slated for Nov. 9, the same day as sister resort Sunshine Village. Early-season skiing, on the Glacier Express lift, is typically a mix of manmade and natural snow, and the temperatures in November are usually milder than they are later in the winter. Don’t Miss: Lake Louise’s ski season really kicks into high gear with men’s World Cup Super G races Nov. 24-25. The women’s World Cup drops in for Super G races a week later, on Nov. 30 - Dec. 2. Why Go: Mammoth is scheduled to open Nov. 8, but if enough snow falls prior to that, an earlier opening is possible. One year, the mountain opened on the preposterously early date of Oct. 5. Skiing, on a mix of manmade and natural snow, starts on the Broadway Express chair and the area around Main Lodge, and Mammoth strives to have skiing (on natural snow) at its other base areas before Thanksgiving. Don’t Miss: Opening weekend (Nov. 8-10) kicks the season off with a huge celebration featuring a champagne toast, live music and an electric party each night. Don’t Miss: You’ve seen it in “The Shining,” but it’s best to experience Timberline Lodge for yourself. 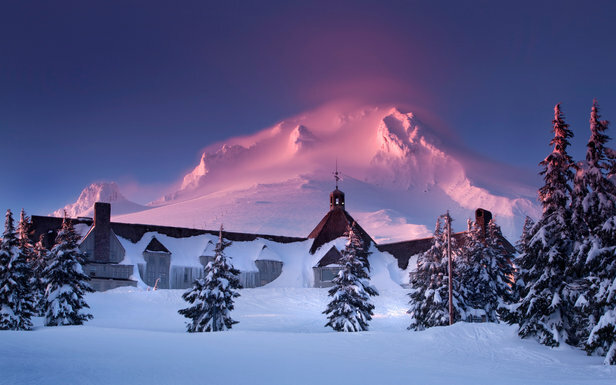 The national historic landmark, built in 1937, offers the only ski-in/ski-out lodging experience in Oregon and is reason enough for a visit. Why Go: Separated by just five miles of mountain road, Keystone and Arapahoe Basin can both be skied on the same day pass, as well as the Vail Resorts Epic Pass. And both are among the first ski areas in the U.S. to open each winter. A-Basin typically opens in mid-October, while Keystone is set to open on Nov. 9 this year. To start, skiing is on mostly manmade snow, but the resorts’ high elevation makes them susceptible to early season storms. Don’t Miss: A-Basin will be hosting their first Rise & Shine Rando race at Mountain Goat Plaza at 10,780’ and finishing near the summit at 12,474’.